From Daiwa Saltist a telescopic rod extremely sensitive for beach ledgeringHigh modulus carbon blank Guides Fuji-Alconite. Screw tubular reel seat - High Density EVA handle at the heel Action de pointe, Scion full metal plug with end a.. The Alivio EX Telesurf delivers more than you expect from a rod at this price point. It's sensitive, has a Shimano Vibra spot reel seat and is build on a XT30 carbon blank that produces a powerful casting action. Designed for the occasional surf angler or novice, the Alivio EX is a capable p.. The range of Alivio All Round telescopic rods covers a wide range of freshwater and saltwater techniques. From light spinning right up to light saltwater shore and rock fishing. Built on remarkably slim blanks XT30 , usually found on much more expensive rods, and fitted with Shimano stainles.. The Beastmaster EX Surf Telescopic combines excellent action with convenient transportation. All rods in the range have a powerful tip action suited to casting weights from 150g to 170g. The Slide'n grip reel seat allows you to personalize the reel positioning for a perfect casting performan.. 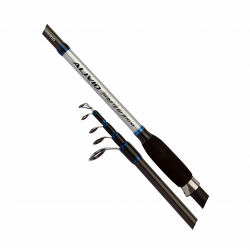 The Catana Mormora fishing rod is a soft action telescopic rock fishing rod for general rough ground species. 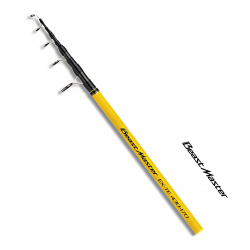 A light rod casting up to 100g designed in Italy for sea bream off the rocks.It can be used for light competition beach fishing for all species but because of sensitive .. The Nexave Surf range offers excellent value for money combined with superb performance. The Nexave BX Surf 2pcs are built on XT60 carbon blanks and offer low down casting power with sensitive tips. All models have Slide 'n' Grip reel seats and are fitted with Shimano Hardlite guides. .. The Nexave Surf (3PC) is new in the surf-rods family. It is a mid-segment rod with excellent casting capabilities and beautiful looks.The 425 models have plate reel seats, while the 450 models have DPS reel seats and both have Seaguide quide. Because of the XT60 blank it's built to cast big dist.. The new Nexave EX Surf Tele is improved on blank construction and looks, making it a perfect tele surf rod in the low-mid price range. This model at 4,5m manufactured with XT 60 Carbon and features with stainless Sea Guide quides.The reel base is Shimano and the handdle is Cast Control.. The Power Aero Surf has enormous power, which will satisfy the most experienced distance casters. The slim HPC300 carbon blank, with added Biofibre, also benefits from the very latest Nano Alloy technology producing a remarkable blank. Fitted with the very best Fuji guides and a Fuji NS reel.. The Speedcast Surf is the ultimate weapon for every surf angler.Slim, ultra responsive HPC200 Carbon + Biofibre blankFinest Fuji componentsFuji DPS reel seatFuji stainless steel Alconite guidesIf you are looking for a top quality surf casting rod to see you through all you needs then you need look n.. Perfectly suited for competition anglers, or anyone who requires a rod with top of the range technical features, the Speedcast Surf offers great performance. Built using HPC (High Pressure Carbon) HPC200 carbon + Biofibre and fitted with Fuji stainless steel Alconite guides, the Speedcast al.. 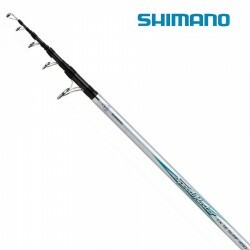 The new SpeedMaster BX Surf 3pcs from Shimano is a very powerfull rod for Surf Casting fishing method.The rods are very powerfull made by XT200 blank that gives you strong performanse and because of the Solid Tip gives you an excellent sensitivity.The rods designed well balanced and light weight whe.. Your new SpeedMaster CX Surf telescopic from Shimano is here.Manufactured from XT200 + Biofibre carbon black with fast action for excellent casting performance.You will have also Fuji Alconite guides , Fuji DPS reel seat , Cast Control grip.The SpeedMaster comes with Hard carrying case and gui.. The optimised construction of the Ultegra TE telescopic surf rods produces more casting response and a lower weight, resulting in better casting performance and easier handling. The high end components like the Fuji DPS reels seat and Fuji MN type guides with Alconite ceramic linings also im.. The Ultegra Surf Sensitive is designed to detect even the most sensitive bites.It has a solid and long tip,ideal for detecting every bite even the most timid fish.Extremely light and balanced is build in HPC250 carbon enriched with Biofibre.Guides FUJI with ALconite rings.CodeLengthCasting WeightWei..
Vengeance All Around Tele is a strong rod for light casting & multi use..Comes with Shimano HardLight Guides and Shimano reel seat.Cloth Bag with plastic guide protector.CodeLengthCasting WeightGuides NoWeightTransportation LengthVARTE390XH3,90m75-150gr5345gr125cmVARTE360XH3,60m75-150gr5315gr120.. The Vengeance Surf BXJ rod perfectly complete the extensive collection of Shimano Surfing rods with a value for money hardly matchable by our competitors.Made of Shimano XT30 carbonLowrider guides size 425Shimano Hardlite ringsThread reel holderShimano Dynamic Response.. The Vengeance CX TE Surf offers excellent value for money and choice. Built using Shimano XT-30 carbon with added Geofibre, the slim and lightweight blank delivers excellent casting performance. The Vengeance has Alumina ceramic guides and a secure DPS reel seat .CodeLenghtCasting WeightWeight..